Fall/Winter 2018: "Building Bridges for Learning"
Auburn President Steven Leath recently delivered greetings to the Fall general membership meeting of the Osher Lifelong Learning Institute. In noting his appreciation for OLLI and support for lifelong learning, Dr. Leath also emphasized the importance of outreach as part of the University’s educational mission – “It’s what makes land-grant universities special.” Dr. Leath noted that Auburn strives to “make a difference in the community.” Inspirational teaching and innovative research are clear priorities in fulfilling this objective as well as transformational outreach for the common good. Faculty engagement in particular is a critical component as we seek to improve quality of life in the communities we serve. Thus, it’s important that we recognize the outreach work of our faculty and celebrate the significant impact of their engagement throughout the state and well beyond. That is the goal of the Award for Excellence in Faculty Outreach. The Award for Excellence is Auburn’s highest recognition of engaged scholarship and one of the university’s premier annual faculty awards. Since 2004, the award has recognized 14 of our most outstanding engaged scholars, representing a wide range of academic disciplines and community-based project work. This year’s featured award recipient is Kyes Stevens, director of the Alabama Prison Arts+Education Project and instructor in the College of Architecture, Design and Construction. Kyes Stevens has built a highly recognized and well respected program for incarcerated learners, and has positioned Auburn as a leader in providing educational resources to one of the most underserved populations in the state and nation. She has provided opportunities for more than 100 faculty and graduate students to engage with the prison community as well. She has also extended her work at the national level through a variety of arts and education programs, including White House-sponsored policy forums on prison education. To date, more than 4,400 incarcerated students have participated in this transformational program. APAEP has been awarded more than $2 million in grants from federal agencies and national foundations, including the prestigious Andrew W. Mellon Foundation. Kyes, herself, has been recognized by numerous fellowships and awards, including Auburn’s Women of Distinction Award, and as one of Southern Living magazine’s Southerner of the Year awards in 2016. As President Leath urges us to make a difference toward society’s critical needs, University Outreach is committed to expanding excellent and impactful engagement such as Kyes Steven’s APAEP. Her profile and the stories within this issue of Beyond Auburn are sure to inspire you to be a part of the great outreach mission of Auburn University. The Office of Outreach Global is holding a stuffed animal drive for children in Sekondi, Ghana. Drop-off locations: Outreach Global’s Office at 116 O.D. Smith Hall, Auburn, AL., 36849 -or- OLLI Office at Sunny Slope, Auburn. All stuffed animals will be donated to children in Sekondi Community in Ghana, West Africa who participate in AU Healthcare. Deadline for Donation: February 2, 2019. Please note, items will still be received after deadline is closed. Contact: Dr. Elizabeth Essamuah-Quansah or Mac-Jane Crayton, Office of Outreach Global by phone 334-844-5716 or email outrglb@auburn.edu or visit our website: www.auburn.edu/outreach/global. Individuals in prison make up one of the most educationally underserved populations in the nation, especially in Alabama. Over the last 17 years, Kyes Stevens has been building bridges to learning for incarcerated persons through the Alabama Prison Arts + Education Project (APAEP). Stevens, director of APAEP and instructor in the College of Architecture, Design and Construction, is the recipient of the 2018 Auburn University Award for Excellence in Faculty Outreach. The award, which is Auburn’s highest recognition of engaged faculty scholarship, was presented to Stevens at the University Faculty Awards ceremony in November. College of Architecture, Design and Construction associate dean Karen Rogers, who nominated Stevens for the award, stresses the significance of Stevens’ outreach accomplishments. “APAEP addresses a tremendous need by bringing the wealth of knowledge and instructional capabilities of Auburn University to a group of people for whom education has become the means by which they can build better lives…” says Rogers. The program also “has generated research and publications not only for Stevens, but for other educators who have worked with the program as well.” Indeed, Stevens has engaged more than 100 graduate students and fellow faculty in the APAEP, many of whom credit Stevens and APAEP as the inspiration for them to develop their own outreach work with prisons in other states. Stevens attended Auburn University, earning her bachelor of arts degree in English. She completed graduate studies at Sarah Lawrence College in New York, earning her master of arts in Women’s History and a master of fine arts in poetry. After returning to Alabama, Stevens was awarded a prestigious fellowship from the National Endowment for the Arts in 2001 to teach poetry at Talladega Federal Prison. The first phase of what is now APAEP was called the Alabama Prison Arts Initiative, and was initially funded by the National Endowment for the Arts in 2003. In 2004, APAEP took its current name when it became a full-time program of Auburn’s Caroline Marshall Draughon Center for the Arts & Humanities. In 2008, APAEP moved to the Department of Psychology in the College of Liberal Arts. There, graduate students became more involved in research on the impacts of APAEP programming. The program later moved into the Department of Human Development and Family Studies, in the College of Human Sciences, and for a time was housed under the Provost’s office. Today, APAEP is headquartered in the College of Architecture, Design and Construction, with collaborations with Auburn’s College of Liberal Arts, College of Sciences and Mathematics, Harbert College of Business, College of Human Sciences, College of Agriculture, College of Education, and the Ginn College of Engineering. From one poet teaching in one prison, APAEP course offerings have grown from poetry to a wide variety of courses and programs in the arts and humanities, science and mathematics, business, and other academic studies. Stevens believes education is a powerful tool for shaping people’s lives. On that principle, the Alabama Prison Arts + Education Project is dedicated to bringing educational opportunities to the adult prison population, fostering a relationship with learning that would continue to grow for the rest of their lives. Data clearly demonstrates the impact of educational attainment on post-incarceration success. The average educational level of the Alabama prison population is around the 7th to 8th grade. Undereducated prisoners have high recidivism rates, or rate of return to prison. Prison fiveyear recidivism rates nationally hover around 70 percent of former prisoners returning to prison. However, the higher the level of educational achievement, the less likely a person is to return to prison. For those engaged in higher education programs such as APAEP, the recidivism rates are about five percent. People who do not return to prison contribute to the economic growth of their community, and the stability of their families. Thus, APAEP represents an investment in creating a better Alabama, both for the individuals as well as their families and the towns in which they reside. The statistics related to this program under Stevens’ leadership are impressive: more than 4,400 incarcerated students have enrolled in 283 semester-long classes offered. More than 175 faculty and graduate students from Auburn and the state have produced almost 8,000 contact hours of classroom instruction. The program has been awarded more than $2 million in grant funds, including near consistent support from the National Endowment for the Arts. In 2016, Auburn University/APAEP was selected as one of 67 programs nationally to participate in Second Chance Pell, a program of the U.S. Department of Education. In 2018, APAEP and Auburn received a $900,000 grant from the prestigious Andrew W. Mellon Foundation, thus becoming one of fewer than 10 such higher education programs supported by Mellon. Stevens is a driving force for outreach and engagement nationally and internationally. She has served on both the National Justice Arts and the National Alliance of Higher Education in Prisons. She has been invited on three occasions to serve on White House advisory panels on the role of higher education in criminal justice reform. In 2017, she served on a panel at Harvard University addressing programing for formerly incarcerated students at the university. Stevens is currently working to develop a program partnership with the University of Darwin in Northern Australia. In spite of this rigorous schedule of teaching, publication and presentation, Stevens still finds time for another one of her passions – animals. Engaged in animal rescue work for most of her life, Stevens specializes in care for special needs kitties. Stevens has been recognized for her efforts by Auburn University as a recipient of the Young Alumni Award and a Women of Distinction Award, and by being invited to participate in the “This is Auburn” lecture series. In 2014, Stevens was selected by the Alabama State Council on the Arts for its Literary Arts Fellowship. In 2016 she received both the AL.com “Women Who Shape the State” and Southern Living magazine’s “Southerners of the Year” recognitions. One of APAEP’s longest serving faculty teachers in the program, Barb Bondy, professor in Auburn’s Department of Art, sums up the merit of Steven’s engagement for the Award for Excellence in Faculty Outreach. “Considering APAEP’s humble beginnings and growth to outstanding accomplishments over the years, it is evident that Kyes Stevens fulfills the essential characteristics of outreach excellence at Auburn University,” says Bondy. While the curriculum committee was planning OLLI classes for Fall 2018, the subject of who had taken classes the longest arose. Mary Burkhart, OLLI’s original director, suggested, among others, Gordon Johnson, Helen Brown, Casey and Margaret Scarborough. Following that conversation, the committee decided to visit one of the members of longest duration, Helen Brown, who will be 100 years old in February 2019. In the last 28 years, Helen has rarely missed a semester of OLLI classes. Mary Burkhart and two other OLLI members visited Helen one afternoon and enjoyed several hours of stories about OLLI at Auburn’s early days. AUALL (Auburn University Adult Lifelong Learning) was OLLI’s predecessor. Margaret and Cayce Scarborough hosted the first reception for AUALL at their lake house. They also sent cards to friends in town encouraging them to join AUALL. Helen and Mary both agreed that even the early classes were interesting, which has been a major factor in OLLI’s continuing success. Helen, who was not an “original” member in Spring 1990, has been taking classes regularly since the Fall 1990. 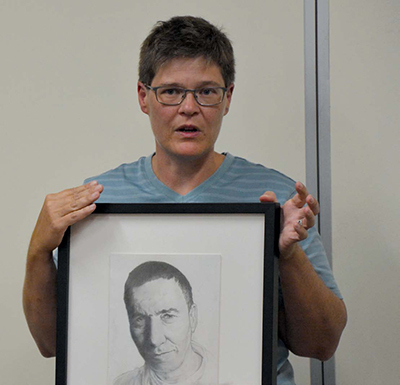 In addition to taking classes, Helen has continued to tutor 37 different incarcerated females since 1987. In 1989, Mary Burkhart was working in Auburn University’s Continuing Education programs for adults of retirement age. Classes were actually offered during the first spring term of 1990. Thirty-seven people signed up. Gordon Johnson, one of the original members, was on the Steering Committee and is still attending classes. Other early members mentioned in our afternoon discussion were Henry Henderson and Margaret and Cayce Scarborough. Participation actually doubled for the fall 1990 semester, when 74 men and women signed up for classes. This certainly showed that there was a definite need for continuing education classes for seniors in Auburn, Alabama. The total number of interested adults of retirement age taking classes topped 100 in 1991. Mary Burkhart was the State Director of Elder Hostel, and was also responsible for planning the classes for AUALL. When Mary had attended an Elder Hostel program in Washington, DC, in 1988, she heard about the Osher Foundation and their interest in providing classes for adults in college towns. Mary, still working part time in Continuing Education, determined that Auburn’s AUALL would put together a proposal in 2006 to present to the Osher Foundation in hopes of being awarded some grant money. AUALL did not receive any money that year, but they did receive good advice from the Osher Foundation about how to apply for a grant in 2007. OLLI has been successful in receiving grants from the Osher Foundation ever since, and has now topped the 1,000-member mark in three locations: Auburn, AUM and Chambers County Library in Valley, Alabama. During the fall 2017 and spring 2018 semesters, OLLI at Auburn has provided more than 150 classes for members’ enjoyment and learning. This fall’s 2018 catalog offers 57 classes at four locations in addition to the smaller classes held at the OLLI Sunny Slope home. Sunny Slope is on South College Street just south of the Jule Collins Smith Museum of Fine Art. OLLI’s hope is that one day we will be able to provide more classroom space at that location. Sunny Slope, built in 1853, is on the National Historical Register. The property was bought from the former owners, the Emmerich family, in 2013 by Auburn resident Ann Pearson. Dr. Pearson renovated the house and has leased it to Auburn University specifically for OLLI to use. Helen Brown and other long-time active senior members provide wonderful examples of the joy and pleasure OLLI members receive from taking classes, meeting new people, seeing old friends, learning new ideas, staying active and having a positive attitude. As many families struggle to find access to affordable health care, a historic partnership between the City of Auburn and Auburn University is addressing the problem in the form of a new affordable health care clinic. In 2019, Auburn University’s Health Care Clinic and Educational Center will welcome families to Boykin Community Center in northwest Auburn. 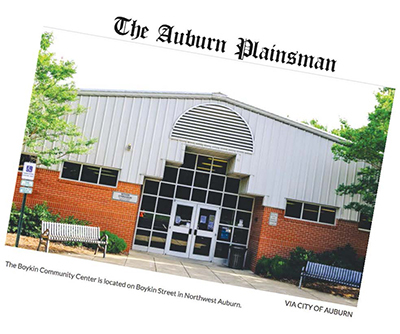 The Auburn City Council approved plans to open the clinic to provide opportunities for families to obtain affordable healthcare while extending educational opportunities for students studying pharmacy, nursing and other health-related fields at Auburn. Auburn’s Harrison School of Pharmacy will manage the clinic, working alongside other health-related disciplines to provide a broad range of care. The clinic’s mission focuses on two tiers – community outreach and student education. With faculty oversight, students will work with patients to gain hands-on learning in a real clinical setting. Auburn students and faculty will serve as health care advocates and providers for families, including the uninsured and underinsured. Families in need will have access to free or affordable services and medications. “We are going to work together to deliver a flexible payment schedule that will meet the needs of the community,” said Dr. Braxton Lloyd. “We are making sure the cost of care is affordable for these families. Pharmacy student Ren Aranda believes the Auburn University Health Care Clinic and Educational Center provides an opportunity for students and patients to learn together. The City of Auburn and Auburn University will spend the next year preparing the clinic inside the Boykin Community Center. The idea is to grow services and eventually staff a fully functional urgent care facility for families. Auburn’s Harrison School of Pharmacy ranks among the top 20 percent of all pharmacy schools in the United States, according to U.S. News & World Report. Fully accredited by the Accreditation Council for Pharmacy Education (ACPE), the School offers doctoral degrees in pharmacy (Pharm.D.) and pharmaceutical sciences (Ph.D.) while also offering a master’s in pharmaceutical sciences. For more information visit: Auburn University’s Harrison School of Pharmacy www.pharmacy.auburn.edu. Alabama experiences an average of 42 tornadoes a year. And when severe thunderstorms form, one of the most trusted sources for weather news in the state is James Spann a television meteorologist in Birmingham. His expertise on tornadoes made him the ideal choice to author the Encyclopedia of Alabama’s entry on the topic. The article explains the conditions that contribute to the frequency of tornadoes in Alabama and highlights some of the significant outbreaks in the state’s history. The popular broadcast meteorologist’s piece is the 2,000th entry added to the state’s premier online resource on Alabama’s history, culture, and natural environment. Spann’s entry is just one of dozens of the sciencerelated articles found in EOA. Its articles on the minerals, geology, wildflowers, and fishes of Alabama are among the most visited entries each year. EOA’s science articles are especially popular during the school year. There are entries on numerous fossils discovered in the state. Some are about dinosaurs that once roamed the area. Others cover Alabama’s mammals, reptiles, birds, flora, caves, river systems, agriculture, and more. These articles drive thousands of visits to the site. In addition to making science content for Alabama’s classrooms accessible, the award-winning site has afforded select graduate students at Auburn an opportunity to gain valuable career-related experience. A recent example of this involved students in Dr. Robert Boyd’s Conservation Biology class. Learning outcomes for the class included developing non-technical science communications skills by writing for a broad, nonscientific audience. EOA offered a real-world opportunity. 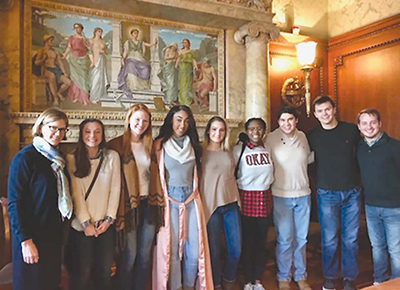 The biology students not only had the opportunity to have their work published, they were able to experience what it is like to work with editors in a professional capacity. In addition to the experience of working with editors, the students also gained an understanding of what is involved in repackaging work they originally created for fellow scientists to a format that is meaningful to readers without a strong background in science. The students were not the only ones to benefit from the exercise. 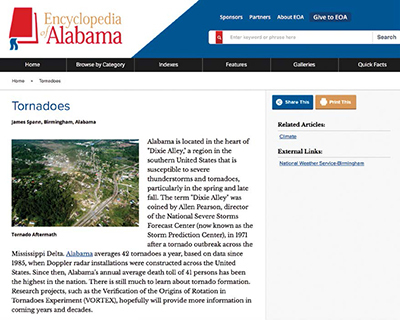 The Encyclopedia of Alabama, a free, online resource on all things Alabama, is a project of University Outreach. This January marked the one-year anniversary of the formation of the Center for Educational Outreach and Engagement (CEOE) Network. The CEOE Network was organized to galvanize and enhance the communication and profile of units engaged in K-12 educational outreach with a commitment to expanding the Auburn University footprint in this arena. Some 15 units across campus have joined the CEOE Network to encourage Auburn University faculty and staff to connect with colleagues engaged in K-12 outreach to enhance educational development partnerships. The Network will serve as an opportunity to collaborate when appropriate and collectively act in an efficient manner. Through the Network there will be collaboration on grants, educational development opportunities and K-12 activities locally, nationally and internationally. By using an interdisciplinary approach to problem solving in the K-12 arena, Auburn University will further opportunities for research and publications through the Network. “We are very excited about our first upcoming Network collaboration which involves the CEOE/ University Outreach submission of a $20-million-dollar GEAR UP grant in the spring. Campus units including theater, computer engineering, and Inclusion and Diversity have already agreed to serve as matching partners in this effort and we hope other units will join us in this incredible opportunity,” according to Stacey Nickson, CEOE director. CEOE Network meets quarterly to: enhance collaboration and coordination on K-12 outreach grants and educational development opportunities; share information about initiatives and best practices in K-12 educational outreach; offer expertise and guidance to promote K-12 outreach both locally and globally and disseminate essential knowledge and skills fostering effective K-12 educational practices. Any units interested in being represented in the Network should contact Stacey Nickson directly at snickson@auburn.edu. The Appalachian Region is home to more than 25 million people and stretches from northern Mississippi to southern New York. The Appalachian Regional Commission, a federal agency established in 1965 to serve Appalachian communities, created the annual Appalachian Teaching Project (ATP) in 2001 to engage students and local citizens through community-based projects in the Appalachian Region. As part of the ATP, Auburn University serves as an Appalachian Center in the consortium of 13 colleges, universities, and community colleges throughout the Appalachian Region. For the 2017 Appalachian Teaching Project, a team of eight Auburn University students partnered with sixthgraders from Tuskegee Public School (TPS) to document the lives of veterans in Macon County, Alabama, by recording interviews as part of the Veterans History Project of the Library of Congress, which collects, preserves, and offers access to personal accounts of American veterans. Throughout the 2017 fall semester, the Auburn team and TPS students collaborated to achieve their goal of collecting 10 veteran interviews to deliver to the Library of Congress. To accomplish this, an advertised veteran interview day was hosted at TPS for veterans interested in preserving the story of their service. The interview day was a success, and over 10 histories were collected and preserved as a result of the project. In addition to the veteran interviews, the Auburn team organized a Veterans Day program at TPS, inviting veterans from the community to share their stories and advice with the TPS students. After completing their project, the Auburn team traveled to Washington D.C. to deliver the veteran histories to the Library of Congress and present their project outcomes at the Appalachian Teaching Project conference. Although unable to travel to D.C., the Tuskegee students joined the Auburn team virtually to help deliver the veteran histories to the Library of Congress, where personal accounts of American veterans can be accessed through their website at www.loc.gov/vets. After delivering the interviews, the Auburn team had met their goals and was able to present the success of their project at the ATP conference. Auburn University’s 2017 ATP project has evolved into the Macon County Veterans History Project with the goal of documenting the lives of veterans in the community. At the beginning of the fall semester, a new Auburn team participating in the 2018 ATP project continued building on last year’s success, collecting additional veteran interviews with the help of TPS students. More information about the project, the veterans, and their interviews can be accessed at www.maconcountyveterans.org. 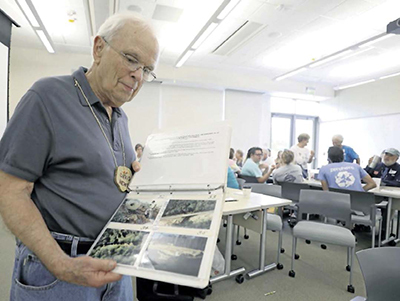 At the annual meeting of the Alabama Water Watch, David Newton stood flipping through the pages of a photo album containing photographs of local bodies of water paired with notes dating back to 1999. 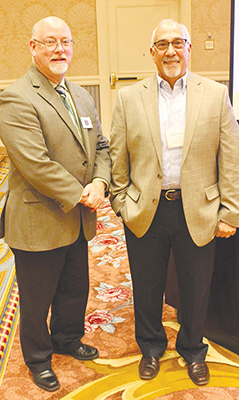 Newton, like the others who were in attendance, has a passion for Alabama water bodies, as well as a desire to monitor and maintain water quality. “I was exposed to it as a youngster and it kind of stuck,” said Newton, an Auburn resident, who added how he’d been an Alabama Water Watch volunteer for 11 years. The Alabama Water Watch is a nonprofit citizen science organization partnered with Auburn University and the Alabama Cooperative Extension System with a mission to “improve both water quality and water policy through citizen monitoring and action,” according to its website. The organization was established approximately 26 years ago and has trained more than 8,000 people with a wide range of professional and educational backgrounds on water testing practices over the years, said volunteer coordinator Sydney Smith. “We’re really based on community, so it’s getting everybody involved with these test methods,” Smith said. Volunteers are trained and certified on three methods of water monitoring: water chemistry monitoring, bacteriological monitoring and stream biomonitoring. Once certified, the volunteers select a spot to monitor and collect data from the same location each month. “So, really, the important thing that we stress is getting trends, long-term data for these sites so they can really learn these water bodies and figure out what potential pollutants could be interfering with the water quality, or if it’s just the natural state of the water body,” Smith said. The youth group at Auburn Unitarian Universalists Fellowship has been involved with the organization for about a year, said church member Julie Meadows. Youth at the church expressed a desire to help make a difference, Meadows said, so she became certified to help facilitate their involvement. “I’m looking forward to getting certified myself,” said Meadows’ son, 15-year-old Phelan. The center, located in Montevallo, had a lapse in data collecting in 2015 but has recently reinitiated the effort with three collection sites along the Cahaba River, Allred said. Those interested in getting involved can do so by becoming certified to collect data, or by donating to the Alabama Water Watch Association, Smith said. Funds to the association are used to purchase educational materials, monitor supplies and support the program. For more information, visit www.alabamawaterwatch. org. Agriculture is one of Alabama’s largest industries, valued at more than $5 billion in crop and lifestock sales annually. However, it is also a dangerous industry, accounting for thousands of work-related injuries with some resulting in permanent disabilities. The goal of the Alabama Accessible Agriculture Project is to make working in agriculture more accessible for farmers and other agricultural workers with disabilities, so they, their families and their communities can continue to succeed in rural America. The initiative is a collaboration of Auburn’s Center for Disability Research and Policy Studies (CDRPS) and the Office of the Vice President for University Outreach. Principals engaged in the project included CDRPS executive director Christine Fleming, Extension specialists Arturo Menefee and Dennis Evans, and CDRPS graduate assistant Haidi Song. The team conducted a basic needs assessment to examine the workplace situation of farmers and farm workers with disabilities in the state’s production agricultural sector and to explore the advisability of a potential statewide agriculture accessibility project. USDA-funded farm assistance “AgrAbility” projects for individuals with disabilities exist in other states, but not in Alabama. The primary focus of the assessment was to: determine the most prevalent disabling conditions of farmers and other agricultural workers in the state; assess the specific educational needs of the target population of farmers with disabilities and their families; take an inventory of available services, resources and information that is currently available to farmers with disabilities; and develop recommendations and strategies to address the needs of farmers and agricultural workers with disabilities. 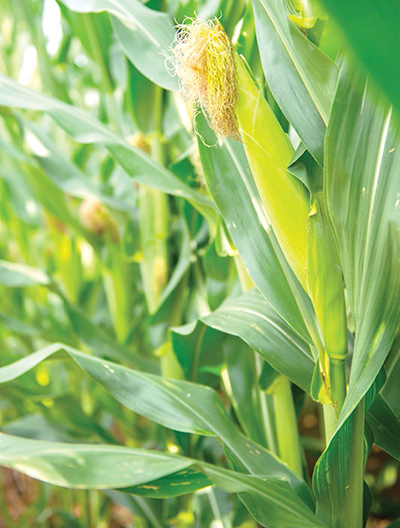 The study was conducted statewide, and collected responses from farmers, Extension professionals, and rehabilitation counselors familiar with disabling health conditions in agriculture-related settings. A number of significant health conditions were reported, including injuries to limbs, back, spine, and brain, as well as hearing loss, arthritis, stroke, respiratory ailments, chronic pain, mental health and other conditions. The study also identified possible assistance needed to help farmers cope with daily work responsibilities. Survey data indicated that many general services exist throughout Alabama providing farmers with disabilities support and education, but there are many barriers to farmers returning to work after injury or disability. Alabama, with its influential agricultural history, has yet to be a recipient of USDA AgrAbility funds. The study concluded that the state could certainly benefit from a comprehensive program to assist Alabama farmers, agricultural workers, and their families with disability issues. The initiative will continue to look at further opportunities for outreach to agricultural workers to implement responsive policies and programs. Since becoming a Miracle Network Dance Marathon chapter in 2011, Auburn University Dance Marathon, or AUDM, has truly made an impact “for the kids.” This summer, Piedmont Columbus Regional unveiled the newly renovated and expanded Neonatal Intensive Care Unit (NICU), made possible through a five-year pledge by AUDM. AUDM is a year-long fundraising effort that culminates with an annual 14-hour event, where students get to meet miracle families treated at their local hospital, participate in games and dancing, and reveal their annual fundraising total. Nationally, there are more than 300 Miracle Network Dance Marathon chapters. Students involved in a campus dance marathon organization spend a year gaining leadership, teamwork, and nonprofit business experience while raising funds and awareness for their local Children’s Miracle Network Hospital. To date, AUDM has raised more than $2.1 million, with $568,417 raised in 2018 alone. The Miracle NICU serves 21 counties in West Georgia and East Alabama. The NICU provides subspecialty care and comprehensive services for at-risk and medically fragile newborns in a comfortable, supportive environment. The new unit includes 46 NICU beds and a layout that features open bays with three walls, which will allow improved privacy for family access and kangaroo care. The renovation will now allow parents more control over room lighting, sounds and temperature, while keeping them close to caregivers and emergency response systems. The expansion will also help hospital staff by increasing patient access, improving ergonomics, providing better visibility to the patient and increasing storage and workspace, which allows for better bedside care. Additionally, the Miracle NICU will offer a Ronald McDonald family room for families and visitors as well as dedicated meeting and education space for staff. 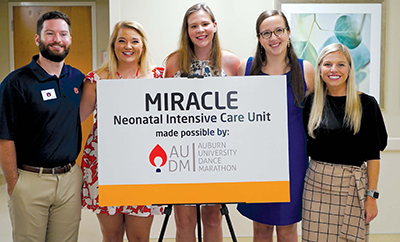 AUDM has won six awards at the national Miracle Network Dance Marathon level, as well as many other awards and recognition for involvement and leadership on Auburn’s campus. For more information about AUDM, visit www.audancemarathon.com or follow them on social media at @AuburnDM. Industry partnerships fuel the work of Auburn University’s Government and Economic Development Institute (GEDI) to train tomorrow’s government and economic leaders. A recent multi-year commitment from Spire will ensure the institute meets economic development needs of leaders, communities and organizations throughout Alabama for years to come. The partnership with Spire will bolster Auburn’s commitment to advancing Alabama communities through the Intensive Economic Development Course. 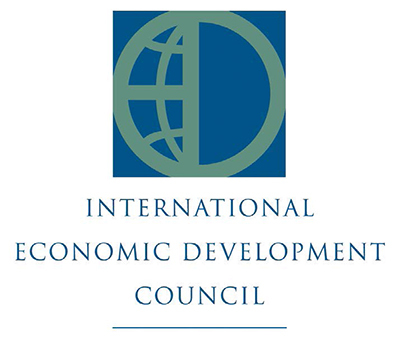 The annual two-week course had sessions in July and September to introduce participants to all phases of economic development, utilizing program leaders and faculty who are the field’s most effective practitioners with proven success in economic development practices and techniques. Spire has supported an array of programs and initiatives at Auburn University in the past and has made significant investments to advance the communities it serves throughout the nation. Through training courses and other resources, GEDI promotes effective government policy and management, civic engagement, economic prosperity and better lives for Alabama residents. The institute’s programs provide support for economic development professionals, elected officials, community leaders, utility company representatives, community and regional planners, chamber of commerce officials and other stakeholders. With more than 30 years of experience, GEDI is the state’s leading provider of economic development education and training. Ghana is located on the west coast of Africa and is known for its diversity of languages and people. It has a rich heritage and unique mix of cultural groups. Despite its colorful culture and background, some Ghanaian communities lack many of the medical resources available in the United States. The Auburn University Outreach Global office decided to do something about that. Together with Auburn’s School of Nursing, Outreach Global sent eight Auburn nursing students, two faculty members and five staff members from Outreach Global to Ghana this spring. The mission of the trip was to medically serve the people in the towns of Sekondi in the western region and Nkanfoa in the central region, and leave them equipped to better serve themselves medically. Essamuah-Quansah, a Ghanaian herself, contacted the mayors of both Sekondi and Nkanfoa prior to the trip to gain their support, which she said they gave freely. She conducted a needs assessment and began collecting medical supplies and toys for the children. Outreach Global and the School of Nursing together conducted a drive to supplement already donated supplies collected by Outreach Global. In total, 10 boxes of health supplies and 30 boxes of academic books and toys were collected for use during the trip and to donate to the local hospitals. 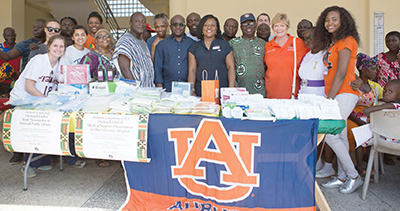 Partnered with the University of Cape Coast, the third largest public university in Ghana, Auburn nursing students and faculty set up free health clinics in the two towns, treating anyone who came to be treated. In all, Essamuah-Quansah estimates more than 600 patients were seen in a span of four days. Auburn students and faculty screened and treated every patient for common ailments, such as ear and eye infections and high blood pressure. The biggest challenges they faced were the lack of paperwork for patients and insufficient medical supplies. The needs of the patients went beyond health care. One patient traveled from a neighboring town to come to the clinic, where students determined he was suffering from appendicitis, a potentially fatal condition. Unfortunately, the patient couldn’t afford the cost of surgery, which amounted to approximately $50. The Auburn team decided to pool their money together so the patient would not be turned away, and he was able to have the surgery. Essamuah-Quansah said he is reportedly doing well. The opportunity for the students to practice health care in a developing country provided hands-on experience in rural health care, which is an opportunity that many nursing students don’t get to experience. The team returned with a better understanding of the global community as well. The students worked for four full days, but had time to experience the culture of the country as well. The first two days of the trip were spent in the capital city of Accra, where students had opportunities to shop, explore museums and visit national landmarks. In addition, the mayor and member of Parliament of Sekondi and the University of Cape Coast president hosted the Auburn team in their homes for meals. The program will be expanded in the future with an additional three days spent in Ghana. A pair of Harrison School of Pharmacy students at Auburn University are teaming up to help those in need in Lee County. Adam Archer and Carl Okerberg, both members of the Harrison School of Pharmacy class of 2020, have initiated a program to increase vaccination rates and address barriers to medication access and adherence. Working through the Mercy Medical Clinic, a free and charitable clinic for the underserved located in Auburn, the pair will focus on introducing vaccine services and helping find resources and eliminate barriers for their patients in affording medications to improve health outcomes for the vulnerable population it serves. 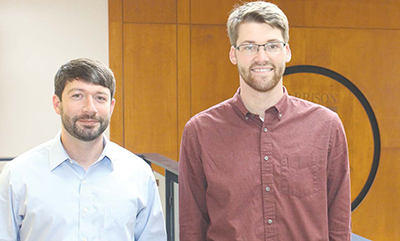 Still in the early stages of implementing the program, the efforts of Archer and Okerberg have not gone unnoticed as they were selected as two of just 15 Albert Schweitzer Fellows in the state of Alabama. Schweitzer Fellows develop and implement service projects that address the root causes of health disparities in underresourced communities, while also fulfilling their academic responsibilities. Each project is implemented in collaboration with a community-based health and/or social service organization. Okerberg found the fellowship and reached out to faculty to find a way to implement it at Auburn. When the pair teamed up, they started out by asking what a pharmacist does best in the healthcare world, particularly when it comes to addressing the needs of the underserved. The brainstorming eventually led them to Mercy Medical Clinic. The project has a few different layers to address current needs of the patient population. The first is to create a vaccination service for Mercy Medical, a service that currently is not offered. The hope is to offer free or discounted vaccinations to the uninsured patients who are the most in need of them. The second step is to increase medication access for current patients, potentially expanding the dispensing capabilities of Mercy Medical Clinic and increase the availability of needed drugs. “The most magical place on earth” set the stage for the Office of International Programs’ first biannual International Perspectives on University Teaching and Learning Symposium. From May 30-June 1, 2018, in Orlando, Florida, a diverse community of teaching and learning professionals, international educators, policy makers, administrators and researchers gathered to network, collaborate and engage in discussions on internationalization in higher education. The symposium covered a wide range of international teaching and learning topics relevant to institutions and their constituents all across the globe. The keynote sessions were presented by Suzanne Ortega who serves as the president for the Council of Graduate Schools; David Sousa who is an innovative educational consultant and author; Daniel Guhr who serves as the managing director for Illuminate Consulting Group; and Heather Ward who is the associate director for internationalization and global engagement at the American Council on Education. In addition to the keynote presentations, professionals representing more than eight different countries shared their perspectives on internationalization in teaching and learning to assist their colleagues in developing actionable ideas to bring back to their respective institutions. The presentations and roundtable sessions included topics such as international collaborations in learning and teaching, students and faculty colleagues as learners, global innovations in the multicultural and multilingual classroom, basic theory and research in faculty teaching and learning, and emerging issues in international graduate education. Over the three-day symposium, professionals just as diverse as their topics gathered to cultivate ideas, communicate effective strategies and foster friendships. Of the attendees that completed a post-symposium survey, all reported that they were satisfied with their experience and 95 percent reported that they were likely to attend the symposium in 2020. For more information regarding the 2018 International Perspectives on University Teaching and Learning Symposium and future events hosted by the Office of International Programs, please visit www. auburn.edu/international. Also, for 2018 highlights and updates on the 2020 event, please like the International Perspectives on University Teaching and Learning Symposium page on Facebook and follow @IPUTLS on Twitter. For the past five years, incoming Honors College students at Auburn University have participated in a weeklong service learning project prior to the start of fall semester. This August, nearly 100 students experienced first-hand the impact that poverty has through a variety of service learning opportunities. The event, dubbed the k(no)w poverty? Week of Service, inspires and engages Honors College students to work toward eliminating poverty in Alabama. According to recent data by Alabama Possible – a statewide nonprofit organization dedicated to reducing systemic poverty and its root causes – Alabama is the nation’s sixth poorest state. More than 800,000 citizens, including 250,000 children, live below the poverty line. An incredible 15 of Alabama’s 67 counties have poverty rates above 25 percent. Because of this clear statewide need, the Honors College at Auburn University adopted poverty awareness as an overarching educational theme that supports the university’s mission to directly serve the pressing, unaddressed needs of disadvantaged communities and at-risk populations. The program was designed to give participants an experience that is both challenging and enlightening. A traditional academic approach is mixed with hands-on learning in order to develop a deeper understanding of the issues surrounding poverty. During the week, participants simultaneously gain a strong knowledge base of the material through multiple lectures, topical films and required reading, all while participating in the hands-on service work. The service locations span Lee, Macon, and Montgomery counties and include volunteering with Alabama Rural Ministry (ARM); Habitat for Humanity ReStore; Storybook Farms; Salvation Army of Lee County; Salvation Army of Montgomery County Soup Kitchen; Jean Dean RIF; Food Bank of East Alabama; Our House; and the Louise Kreher Ecology Preserve. One of the more eye-opening experiences came in the form of a poverty simulation by Alabama Possible. This simulation places the student in the shoes of people who live at or below the poverty line. Students were asked to live a simulated three months while supporting a family, paying bills and dealing with unanticipated circumstances. This simulation puts the hardships of living in poverty into a real-life perspective. Through these simulations, service locations, and academic studies, students are forced to take a deeper look at the difference in their lives compared to others. In fact, in a recent survey with students who participated in the program four years ago, 77 percent stated that participation in the Week of Service influenced their involvement through community service and academic choices while at Auburn. Thanks to the program, these students are creating an environment of service that is synonymous with Auburn University. The k(no)w poverty? project began as a simple, yet informative, letter written to Auburn University leaders from Alabama Possible – previously the Alabama Poverty Project. Patterns and connections between education, economic security and physical well-being were revealed, and gave insight into the long-term effects of recent economic fluctuations for the nation, the state of Alabama, and its individual counties. The Office of Professional and Continuing Education welcomed Sam Walden as the assistant director for Auburn Youth Programs in August. Walden previously worked in the Auburn University Office of the Registrar after retiring from the United States Army. 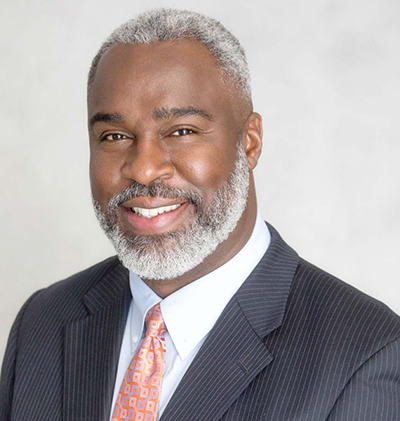 He earned his bachelor’s degree in criminal justice from Georgia State University, a master’s in leadership from Luther Rice University and is pursuing a Ph.D. in Adult Education at Auburn University. He brings to the office over 29 years of leadership and management experience. Sam will succeed Jeff Dyal who began working for OPCE in 2014 as a program developer for Auburn Youth Programs and quickly progressed to assistant director of the program. Under his leadership, youth programs experienced historic growth. Anton Ware spent the past year working as an assistant in the Office of Public Service. A Volunteer in Service to America (VISTA), Ware completed a year of service in September. At the completion of his year at Auburn, he accepted an assignment with the Housing Authority in Sylacauga. While at Auburn, Ware worked diligently with Campus Kitchens, Circle K and AuburnServes. Prior to coming to Auburn, he earned a bachelor’s degree from Troy University and served 10 years in the Army. This summer, the Office of Professional and Continuing Education lost a valued leader, colleague and friend. William Timothy (Tim) Roberts, PhD, RD, LD, CFS, passed away July 2, 2018. Dr. Roberts was the Director of the Auburn University Dietary Manager Program and had been associated with the program for 24 years. As program director and instructor, he had a passion for the program and frequently gave presentations promoting the program. Dr. Roberts had extensive experience and education in the field of nutrition and food science. He obtained his bachelor’s and master’s degrees in Food Technology and Science at the University of Tennessee Knoxville and earned his doctorate from Auburn University in Nutrition and Food Science. In addition, Dr. Roberts taught courses in nutrition, dietetics, and food safety at the collegiate level, and was extensively published in his field. His professional ability and dedication to University Outreach will be greatly missed. The Outreach Global office is grateful to all donors who contributed to the 2017 Annual Healthcare Program in Ghana, West Africa. Donations including books, healthcare supplies, and stuffed animals impacted many children in Sekondi, Western Region and Nkanfoa, Central Region, Ghana. 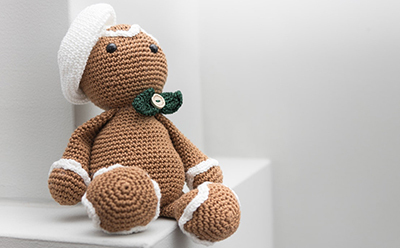 The office will once again be seeking stuffed animals and healthcare supplies starting the first week of November, 2018 and ending the second week of February, 2019 for its Annual Healthcare Program in Ghana. Those interested in participating in the Ghana program should register online at http://www.auburn.edu/outreach/global/ghana-sb.htm or contact Dr. Elizabeth I. Essamuah-Quansah at eid0001@auburn.edu or 334-844-5716 for more information. Dr. Venus Hewing was recently appointed coordinator for Outreach Partnerships and Initiatives in University Outreach. Among her assignments will be projects with the Center for Educational Outreach and Engagement. Hewing worked in the Office of Inclusion and Diversity and Student Affairs before joining University Outreach. Prior to coming to Auburn University, she served as a psychological counselor, Coordinator of Peer Educators and Emergency On-call Counselor at Ramapo College of New Jersey for 17 years. Hewing was born in Columbus, Ohio, and was raised in many places across the country as a military dependent. Dr. Hewing received her bachelor’s degree in public administration from Franklin University, master’s degree in counseling education from University of Dayton, and doctorate in higher education leadership from Union Institute and University. An educator for over 25 years, Dr. Hewing is passionate about higher education and believes it to be the key to liberation that exposes one to unlimited possibilities. Long-time Auburn physics professor and outreach leader Marllin Simon passed away May 28, 2018. Simon joined the Auburn faculty in 1972 as an assistant professor and director of the Undergraduate Physics Lab program. He retired in 2011 as professor emeritus. In addition to his love of teaching college students, Simon recognized the need to provide high school teachers opportunities to improve their instructional skills. He will be especially remembered by teachers and students across the state for his work with his longtime colleague, W. D. Perry, to obtain funding through the National Science Foundation to establish the first summer seminars that became the Alabama Science-in-Motion project. This outreach program provided assistance and laboratory equipment in a mobile platform for teachers and students across the state in physics, chemistry, and biology. Simon devised creative demonstrations to clarify class concepts, organized summer camps and workshops on many subjects, and introduced robotics to schools through the LEGO Robotics challenge. Simon served on the University Outreach Council and influenced greatly the development of supportive programs and policies for faculty engagement at Auburn. Active in the community, Simon loved people and helping others, elevating those around him as well as the university he faithfully served for many years. Professor Simon is survived by his wife of 54 years, Mary Parsons Simon, a large extended family, and many friends, students and colleagues whom he touched across the nation. Auburn University recognized three recipients of the prestigious Algernon Sydney Sullivan Award at the annual President’s Luncheon in April 11, including Hallie Nelson, past president of the Campus Kitchens Project. The award is given annually to individuals who embody high qualities and nobility of character. Nelson has served in various student leadership roles at Auburn, including president and treasurer for Campus Kitchens. Nelson, a native of Birmingham, Alabama, majored in ecological engineering and pursuing a triple minor in community and civic engagement, sustainability studies and Spanish. A passionate advocate for those facing food insecurity, Nelson will be serving next in the U.S. Peace Corps in Paraguay. A partnership of Auburn University College of Agriculture, the United States Agency International Development (USAID), Uganda-Kenya AquaFish program, Oregon State University and National Agricultural Research Organization in Uganda has helped to develop a cell phone app for fish farmers. The “Agro Market Day” app provides fish farming guides, market prices, and product resources for local farmers. Over 1,000 users have signed up to date. A showcase was held July 26, 2018, featuring musical and reading performances by local student participants of an innovative new summer camp program. The showcase was a culmination of the latest collaboration between Auburn University Outreach and the Boys and Girls Club of Greater Lee County. This major new arts program was developed and supported by University Outreach’s Center for Educational Outreach and Engagement (CEOE) and piloted during the Boys & Girls Club summer camps in Auburn. The program was launched in June and completed in July. Major features of the camp included The Reader’s Theater and Elocution Instruction, led by Mrs. A. Faye Boykin-Calhoun, 2007 International Toastmaster Hall of Fame Inductee, motivational speaker, bestselling author, dramatist, and creative artist. This experience enhanced students reading skills, promoting their zeal to read more. The camp provided students a memorable introduction to theater performance designed to enhance their voice inflection, diction, and articulation. The students had opportunities to create scripts, and make stories come alive by using countless emotions, gestures, and body language. Outstanding musical talent was also incorporated with the use of Congo drums, tambourines, and microphones that add special effects. The showcase allowed students to display what they had learned from Reader’s Theater. During this event, the students presented their versatile music, production and reading talents, with the performances staged in the style and culture of Cameroon. In addition to excitement of performance, the showcase also helped students build confidence while gaining experience in competition and presentation. Please contact Dr. Venus Hewing, Center for Educational Outreach and Engagement at vrh0003@auburn.edu or (334) 844-5803, for additional information. March marked the one-year anniversary of Auburn University’s Korea Corner. Founded with the help of the Consulate General of the Republic of Korea in Atlanta, the Office of the Vice President for University Outreach and the Office of Professional and Continuing Education, Korea Corner provides educational and cultural resources to both Koreans and non-Koreans in Auburn. Over the past year, the Korea Corner has touched the lives of many members of the Auburn community and beyond. 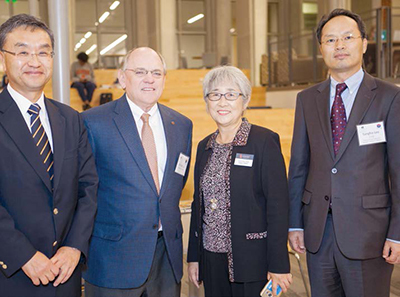 A panel discussion on the North Korean Conflict and the ongoing Brownbag Lecture Series engaged community members in discussions about modern Korean society, economics, and politics. In addition, language classes, cultural classes, movie nights, discussion clubs, and Korean cooking classes were available through Korea Corner during the academic year. 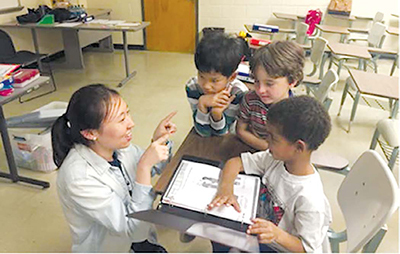 This fall, the Corner began working with Auburn City Schools to provide a Korean Language and Culture afterschool program. Together with University Outreach, College of Education, and the nearby Korean automotive companies, the Korea Corner continues to support the Global Studies in Education: South Korea program, which promotes knowledge of Korean culture and educational systems by allowing local teachers and administrators to visit Korea. This year, the Korea Corner contributed $23,700 to the program made possible by generous gifts from Mando, Hanwha, Seohan, Daewon America, SL Alabama and Ajin USA, SJA, Iljin Alabama, Kwangsung America. 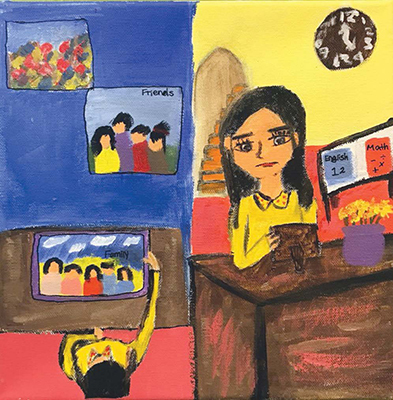 “Korea Corner serves as an anchor for promoting cultural understandings between Koreans and nonKoreans to ultimately create a harmonious community climate by widening worldviews of all involved,” said Suhyun Suh, coordinator for Korea Corner. The Korea Corner operates within the Office of Professional and Continuing Education, a division of Auburn University Outreach. For more information on Korea Corner or to see a list of events, visit auburn.edu/ opce/koreacorner. The Government and Economic Development Institute, a unit of University Outreach, recently released Alabama Issues 2018, a collection of short, researchbased articles intended to stimulate public discussion and engagement, leading to improved public policy and practice. Four focus issues were selected for inclusion based upon their relevance, urgency, and consequence to quality of life and economic prosperity for the state of Alabama, its communities and citizens. Those issues are PK-12 education; criminal justice and prison reform; healthcare access; and state budgets and taxes. Authors were selected based upon their demonstrated expertise and experience. 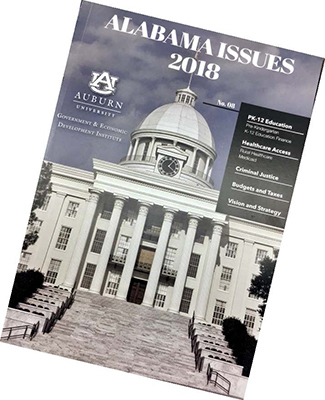 Alabama Issues 2018 was produced with the hope that it will provide guidance for those taking office, and direction for concerned citizens so that discussion and research into these issues will lead to informed and collaborative decision making and action. In concert with this publication, the annual GEDI Policy Summit will be focused around these issues. The Policy Summit is scheduled for February 19-20, 2019, at The Hotel at Auburn University and Dixon Conference Center. For more information on Alabama Issues 2018 and the GEDI Policy Summit, visit www. auburn.edu/gedi. 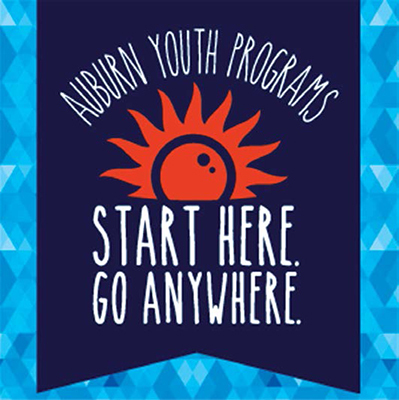 Auburn Youth Programs, within the Office of Professional and Continuing Education, offers camps and programs designed to help kids find their passion, shape their future, and become future leaders. From Outdoor Adventure Camp and Chef Tech Academy to Musical Theatre and World Affairs seminar, there is a camp for every interest. Each year, kids from around the world travel to Auburn University to attend one of more than 60 summer camps and programs specifically designed to educate and inspire youth in a variety of academic, athletic, and extracurricular endeavors. 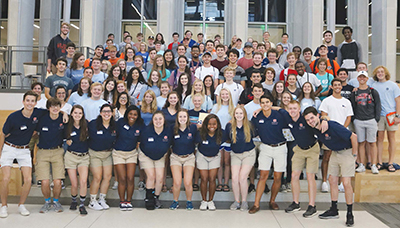 This past summer, over 4,000 students representing 33 states from California to Maine attended camp to further their education and skills while making new friends and experiencing life at Auburn University. Camp registration for summer 2019 opened in December. Visit www.auburn.edu/summercamps for more information. “Journeys: Immigration Narratives by Auburn High Students” is a group exhibition at the Jule Collins Smith Museum of Fine Art, Auburn University. The exhibition, organized by museum education curator Xoe Fiss and Auburn High School art teacher Samantha Shipman, includes 17 individual works of art. Through classroom visits and a field trip to the museum, English as a Second Language students practiced visual literacy skills and learned about art techniques that helped inform their work. Many students created a painting for the first time, embracing the project and bravely confronting the difficult emotions associated with their experiences. The paintings and accompanying written narratives represent what each student thought was important for an American audience to understand about their journeys. Many have experienced trauma in their home countries and fled extreme poverty or violence. All of the artists express the challenges of adjusting to a new culture, from learning a new language to combating stereotypes about their home countries. According to the American Immigration Council, immigrants make up over 3 percent of Alabama residents, and about 3 percent of residents are nativeborn U.S. citizens who have at least one immigrant parent. Art teacher and co-organizer Samantha Shipman says that art is a powerful tool for expressing what can’t always be expressed with language, and that these stories are just the tip of the iceberg in understanding the experiences of the Auburn community, noting the importance that everyone in our community feels valued and welcomed. “You can see from their stories and artwork some common threads—being separated from parents at a young age, witnessing gang violence, experiencing extreme poverty, and through all of that, a resilience and hope for a better life,” said Shipman. In addition to the museum exhibition, the stories and artwork are posted online at jcsm.auburn.edu/journeys. The American Association for State and Local History, or AASLH, recently announced that the Caroline Marshall Draughon Center for the Arts and Humanities in the College of Liberal Arts at Auburn University is the recipient of an Award of Merit for “Remembering the Great War: Alabama and World War One.” The AASLH Leadership in History Awards, now in its 73rd year, is the most prestigious recognition for achievement in the preservation and interpretation of state and local history. “Remembering the Great War: Alabama and World War One” is a traveling exhibit created by the Caroline Marshall Draughon Center for the Arts and Humanities and the Alabama Department of Archives and History, with assistance from industrial design students in Auburn’s College of Architecture, Design and Construction and Associate Professor Shu-Wen Tzeng. The exhibit commemorates the centennial anniversary of the state’s involvement in the war and enlivens an important period of history which often goes overlooked. “Remembering the Great War” tells the story of the war from the perspectives of Alabamians whose lives were shaped by the conflict. For more information on the exhibit, its creators and content, go to www.rememberingthegreatwar.org (http://www. rememberingthegreatwar.org). The American Association for State and Local History is a not-for-profit professional organization of individuals and institutions working to preserve and promote history. From its headquarters in Nashville, Tennessee, AASLH provides leadership, service and support for its members who preserve and interpret state and local history in order to make the past more meaningful in American society. 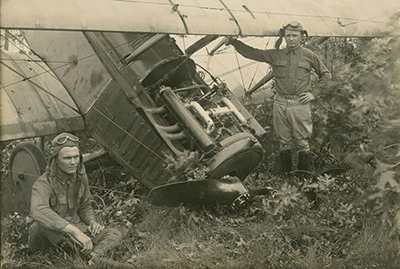 The AASLH awards program was initiated in 1945 to establish and encourage standards of excellence in the collection, preservation and interpretation of state and local history throughout the United States. The AASLH Leadership in History Awards not only honor significant achievement in the field of state and local history, but also bring public recognition of the opportunities for small and large organizations, institutions and programs to make contributions in this arena. The Caroline Marshall Draughon Center for the Arts and Humanities in Auburn University’s College of Liberal Arts creates opportunities that explore our individual and collective experiences, values and identities through the creativity of the arts and the wisdom of the humanities. For more information about the Center, visit www.auburn.edu/cah. In Guatemala, Nicaragua and Costa Rica, a surplus of abandoned, loose and stray animals is a common and sad sight. Animal overpopulation has left many animals to fend for themselves for food, water, and shelter. Many people in these countries, although they want to help, cannot afford veterinary care, leaving many animals emaciated, lacking both food and proper healthcare. Driven by compassion, a group of Auburn University College of Agriculture students, who are studying animal sciences, made it their mission to increase the animals’ quality of life this summer and traveled abroad with The Vida Volunteer Veterinarian Program. The Vida Volunteer Veterinarian Program helps control animal overpopulation in Central America’s underserved communities at Vida field clinics. 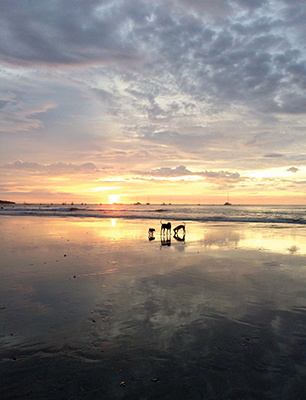 The clinics provide consultations and sterilizations in Guatemala and Nicaragua free of charge, and in Costa Rica for $8, where laws require veterinarian services be paid. Auburn’s students gained clinical and practical experience in veterinary medicine through the service trip. Working alongside veterinary surgeons and anesthesiologists, students were instructed on calculating dosages of medicines, administering medicines, inserting catheters, intubating, extubating and monitoring vitals before, during, and after surgeries. Although these procedures are quite serious, students felt prepared and confident while gaining hands-on experience because of their classes at Auburn. Bowling and Mickle learned about Vida’s program from their academic advisors and attended information meetings hosted by Bri Crowe, an Auburn student who previously volunteered with Vida along with students from other schools. Crowe was able to answer questions and provide insight based on her own experience with the program. Once students arrived in Costa Rica, they faced some tough realities the informational meetings could not prepare them for. One lucky stray happened to be in the right place at the right time when Vida volunteers noticed a fresh wound on his leg. Because of the language barrier, Bowling and Mickle were not able to connect with Costa Ricans as much as they would have liked. However, Mickle said that because of the volunteers, veterinarians and staff, she is planning to return to Costa Rica next year to continue helping the communities there. At this year’s Drone Camp, students in grades 8 – 10 had fun flying drones while applying skills that prepare them for future careers in STEM. Students not only enjoyed the week-long residential camp, but gained hands-on experience with drones or Unmanned Aerial Vehicles (UAVs) piloted by remote control or their smartphone. These students collaborated with other students in the COSAM Sciences Center Auditorium on understanding how to program a drone, learning terminology to fly drones, and practicing complex maneuvers. Participants were from beyond the Auburn area including Colorado, Tennessee, and even two students from China. 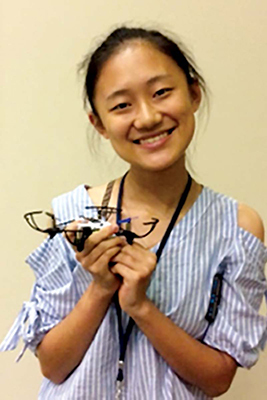 Xiao Xuan Meng enjoyed Drone Camp and wants to encourage girls throughout China to learn how to program and fly drones. She hopes to take what she learned at this year’s Drone Camp back to show other female students that everyone has the potential to pursue careers in science. Walter Mink of Lausanne Collegiate School in Memphis, Tennessee, loved working out strategies to complete the obstacle course. He said the highlight of the camp for him was being able to fly a drone from the pilot’s view with First-Person View (FPV) Goggles. This allowed him to have the perspective of being in the pilot’s seat inside the drone. Drone Camp is hosted by the Southeastern Center of Robotics Education, the Samuel Ginn College of Engineering, the AU Office of Professional & Continuing Education and is housed in the COSAM Outreach Department. For more information about SCORE, visit scoreau.org.